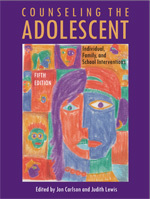 The new fifth edition includes six totally new chapters making this latest edition of Counseling the Adolescent a definitive text. The contributors are experts in the field who blend theory and practice to address all of the important issues related to adolescence. You’ll find practical intervention strategies and proven methods that work, plus material on resilience in children, causes of bullying, school violence, conflict resolution, ethics, and much more. The text begins by addressing the cultural context of adolescent development and how this impacts both the modality and the context of counseling sessions. Next, notable experts discuss individual struggles such as bullying, depression, suicide, and teaching children to care. Family and school issues are also presented along with interventions and activities that will aid in our understanding of the adolescent experience and help adolescents themselves enjoy healthier and more productive lives.